Dark and Dangerous: Revisiting the Dalton Duet as The Plaza Theatre’s 50 Years of Bond Celebration Continues! THE LIVING DAYLIGHTS (1987); Dir. John Glen; Starring Timothy Dalton, Maryam D’Abo, John Rhys-Davies and Joe Don Baker; Monday, July 15 @ 7:30 p.m.; Plaza Theatre; Tickets here; Trailer here. LICENSE TO KILL (1989); Dir. John Glen; Starring Timothy Dalton, Carey Lowell, Robert Davi and Joe Don Baker; Tuesday, July 16 @ 7:30 p.m.; Plaza Theatre; Tickets here; Trailer here. The celebration of James Bond’s 50th anniversary at the Plaza Theatre continues throughout the month of July, and as we hit the middle of the month, we find ourselves at another crossroads in the Bond series. So once again I’d like to draw your attention to a couple of movies you may have overlooked in favor of the higher-profile Sean Connery, Roger Moore, Pierce Brosnan and Daniel Craig entries. Unexpected developments in casting the Bond series always lead to interesting results. Prior to 1969’s ON HER MAJESTY’S SECRET SERVICE (OHMSS; see our Retro Review here), Albert “Cubby” Broccoli and Harry Saltzman’s Eon Productions had unsuccessfully wooed Roger Moore to take over the role of James Bond. Instead, they cast George Lazenby as a more grounded and serious protagonist compared to the increasingly gadget-reliant Sean Connery Bond. The eventual Roger Moore entries, likewise, became increasingly criticized as the 1970s progressed and the series entered the 1980s. The Bond films had seemingly embraced the decade’s love of camp, and also appeared over-reliant on current cinematic trends. By the time of 1985’s A VIEW TO A KILL, the nearly 60-year-old Moore had already been upstaged by the unofficial return of Connery in the non-Eon NEVER SAY NEVER AGAIN (1983)—a film that at least addressed Bond’s increasing age (and Connery was three years Moore’s junior!). Eon then turned its bullet-sights on Pierce Brosnan, who was then starring in the about-to-be-cancelled TV series REMINGTON STEELE. With the Bond interest raising Brosnan’s cache, however, NBC renewed the program and put a kibosh on Eon’s efforts. 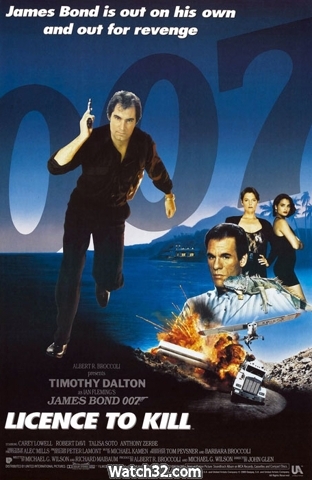 In a move as unexpected as Eon’s offer of the role to George Lazenby, the part was extended to relatively little-known film and TV actor Timothy Dalton. Dalton—most recognized for his roles in 1978’s mini-series CENTENNIAL and 1980’s FLASH GORDON—may have been more of a known quantity than Lazenby in his day, but was untested in comparison to the more-established Roger Moore or Pierce Brosnan prior to their castings. In a parallel with Eon’s desires to take the character back to basics after Connery’s departure, Dalton’s Bond was an attempt to return to the early Connery days and to bring back realism to the series. And with 1987’s THE LIVING DAYLIGHTS, the series delivered the darkest Bond to date: a tense tale of espionage between MI6 and the KGB in the waning days of the Cold War and the Soviet occupation of Afghanistan. Timothy Dalton and Maryam D'Abo in THE LIVING DAYLIGHTS. Looking at the film today, Dalton brings a grim seriousness to his Bond, obviously still haunted by the death of his wife Tracy and channeling his violent energy into the work. His self-performed stunt work is also excellent. The direction by veteran Bond helmsman John Glen is tight, yet still preserves the gloss and slickness long associated with the franchise. It’s a solid effort all around, with a screenplay that rises to the demand of re-establishing Bond in the contemporary world nearly as successfully as OHMSS. While some critics went after the film’s lack of humor, I feel that it’s one of the most underrated Bonds: a hard-hitting take on the character with a keen intensity not generally seen in the series. The only downside to the film is its dated score (the last by John Barry, incorporating glaringly ‘80s sequenced rhythm tracks) and a truly unfortunate title song by A-Ha. Sadly, a confluence of events derailed what looked to be a developing good thing and cast a shadow on the fortunes of 1989’s LICENSE TO KILL. The fall of the Soviet empire ended the Cold War and suddenly made traditional Bondian international espionage seem dated: the very fate that Ian Fleming worried would impact the series in the mid-’60s. In response, the film focused on an international cocaine-smuggling ring, a storyline which made the film seem to be jumping on the bandwagon of nearly every other successful action-adventure franchise of the time. In addition, a writers’ strike led to difficulties in scripting the film as long-time Bond screenwriter Richard Maibaum was largely removed from its creation. If that weren’t enough, budget problems resulted in this being the first Bond not to feature locations filmed in the U.K. Instead, the movie was shot largely in Florida and Mexico. The success of LIVING DAYLIGHTS’ darker take on Bond led to this film offering an even darker and more violent look at the character, but instead of extending what worked about Dalton’s performance, it further removed Bond from his previous depictions and rendered him almost unrecognizable. Critically speaking, LICENSE TO KILL self-consciously takes things too far, resulting in a James Bond movie that doesn’t really feel anything like a James Bond movie. Dalton succeeds much as he did in the previous film, but his good efforts are in service to a compromised vision and merely echo the previous, better film. In an ill-advised attempt to recall an OHMSS plot point (and perhaps to justify the lack of London locations and keep official MI6 spy work out of the picture), Bond unsuccessfully attempts to resign from MI6. (In OHMSS, Bond is instead given leave, and in LICENSE Bond is temporarily suspended and his license to kill revoked.) It may have been an attempt to link this depiction of the character to his source, but it simply shows how much better this plot turn was handled in the 1969 entry. Even as a general action film, LICENSE falls flat in comparison to other contemporary efforts such as 1987’s LETHAL WEAPON or 1988’s DIE HARD. Is it a horrible film? Not hardly. Even the worst films of the Bond series are still entertaining. But it’s definitely a disheartening effort when compared to the entry that immediately preceded it. Unfortunately, Dalton was never able to star in another Bond film. Legal problems put a hiatus on the series, and it would be six years before another Bond film would be made. During the break and with the future of the franchise in doubt, Dalton decided to hang up his hat and move on to other projects. Because of his limited run, Dalton’s films have been largely overlooked (another echo of Lazenby’s turn), but they deserve a closer inspection. His approach to Bond lays the seeds for Daniel Craig’s eventual more gritty portrayal, and beyond the pleasures that both films offer (though admittedly harder to come by in the second), it’s interesting to view them now in light of the recent Bond films.